The DepartAlert Door Monitoring System is a tool for any Memory Care or Nursing home facility looking for anti-wandering solutions. When a resident wearing a wristband transmitter is attempting to exit through a monitored double doorway the DepartAlert Door Monitor alerts the caregiver with an audible and visual alarm. The caregiver can turn off the alarm with the remote reset button (included in system) or with the optional "caregiver key" which tamperproofs the door monitor (sold separately). The door monitor is easy to set up; mount the door alarm system, plug in door alarm to power outlet, put the wristband on the resident and test the system (optional transmitter and receiver tester can be used to test system: sold separately). 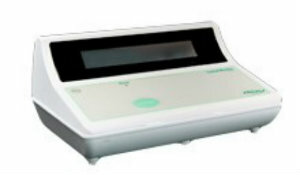 The Door monitor will alarm when patient or resident wearing a wristband transmitter is within 10-14 ft. from the door alarm or when the door is opened by a resident wearing a wristband transmitter. 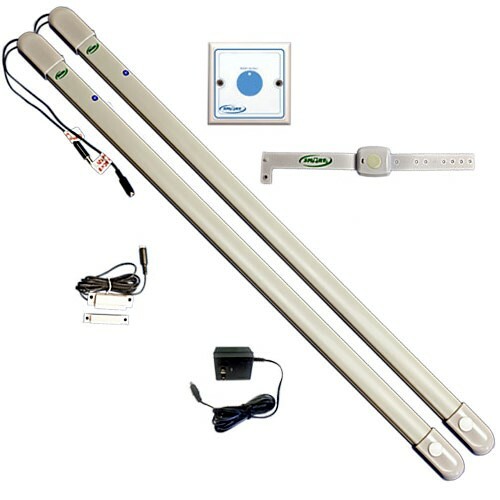 If this is used in a large facility; this door bar system works with the EliteCare+ Central Monitoring Unit which will identify the door alarming and the wristband identification number of the resident attempting to exit through the monitored doorway. The DepartAlert Door Monitoring System is a great anti-wandering tool that is affordable and easy to use. Easy to Use - Just mount door monitor bar, plug in, put wristband on resident, and test the system. Anti-Wandering Solution - This is a great addition to any home or facility that has residents who tend to wander. Tamperproof - Can be set up so that the Caregiver Key is all that can reset the monitor. Two Door Bars - Can be used on large double doors. Alerts caregiver when the resident is getting close to the exit door or is attempting to exit. Can be used in most settings; in-home, large facility, small nursing facility.